Fast radio bursts (FRBs) are no strangers to regular Astrobites readers– these mysterious radio signals are bright bursts of radiation which last a fraction of a second before disappearing, never to repeat again. Not much is known about them except most (but not all) appear to originate from very far away, outside the galaxy. Various theories have been proposed as to what may cause these signals. 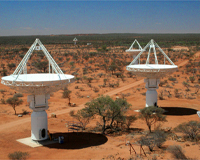 Many astronomers pointed out the signals may not be real at all: since the first was published in 2007 there have only been six FRBs recorded in the literature, all of which were detected at Parkes Observatory in Australia, while surveys at other radio telescopes came up empty. Based on this, debate raged as to whether the FRB signals could be from a more mundane origin than pulsing from beyond the galaxy, such as instrumentation noise or some unique phenomena at the Parkes site like unusual weather patterns. 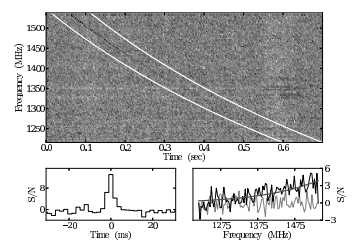 Figure 1: The signal from FRB121102- the big top plot shows the signal in time and frequency (showing its dispersion measure), while the lower plots show the signal to noise ratio with respect to time (left) and frequency (right). The FRB’s properties are the same as those detected previously at Parkes. Today’s paper is a vindication for the radio astronomers who insisted FRBs are astronomical in nature: it reports on the first-ever FRB detection by a telescope other than Parkes! Specifically, this FRB was detected at Arecibo Observatory by the Pulsar ALFA Survey, which surveyed the galactic plane at 1.4 GHz in order to detect single pulses from pulsars. Known as FRB 121102, the pulse was observed in November 2012 in one of 7 beams in the receiver ALFA uses, lasted about 3 ms, and came from the direction of the galactic plane. Despite this, astronomers think it’s likely the pulse originated from outside the galaxy based on its dispersion measure, or how much the signal’s frequency is “smeared” due to traveling through space (as explained well in this Astrobite, signals arrive later in lower frequencies when traveling long distances, giving an estimate on how far away the signal originated). This FRB’s dispersion measure was three times greater than the maximum galactic dispersion measure expected in the line of sight from which the FRB was observed, based on the distribution of matter in that part of the galaxy. While the authors suggest the pulses might be from a rotating radio transient– a special kind of pulsar- no other pulses were detected in follow-up observations so the signal is probably not just an unusually bright pulse from a pulsar. Instead, the authors point to how FRB 121102’s high dispersion measure- combined with similar properties compared to previously observed FRBs- suggest an extragalactic origin for the pulse. Using the observed dispersion measure of the pulse and estimates on its scaling intergalactically, the team concludes the FRB originated at a distance of z= 0.26, or 1 Gpc away. Just what could be creating bright bursts so far away is a definite mystery! Finally, based on their detection of this FRB the authors estimate a similar event rate to the previous one set by Parkes Observatory, whereby there should be thousands of FRBs in the sky every day. (They are just very hard to detect because they are so brief.) And the fact that this is the first pulse detected by an independent observatory is very encouraging, as it certainly gives credence to the idea that Fast Radio Bursts are a real astronomical phenomenon. With luck, we will soon hear about many more FRB detections from multiple observatories, which may unravel the secrets of where they come from. EMU: A Radio Survey of the Southern Sky New Evidence of an Asteroid Encountering a Pulsar Do Fast Radio Bursts Come from Flaring Stars? A Fast Radio Burst From Close to Home? Interesting, is there any recorded sound?